The Hyper Luminal Compressor features the first hybrid design in a compressor pedal: an analog VCA controlled by a digital side-chain allowed us to capture and include the characters of some of the most legendary compressors in history while keeping the signal path completely analog. Mixes the clean and effected signals. Unlike our distortions, it is placed before the Output control. So the Hyper Luminal can also be used as a transparent booster with this control at minimum. Sets the time constants (Attack and Release). You can use the Darkglass Suite to fine tune and custom map the time constants, you can also assign different behaviours for each Mode. Sets the overall output volume of the unit. Sets the overall amount of compression. This control also affects the internal makeup gain. Adjusts the amount of compression. A Micro USB B connector allows you to connect the pedal to PC/Mac to set Time settings, parameters, and future firmware upgrades via the Darkglass Suite. 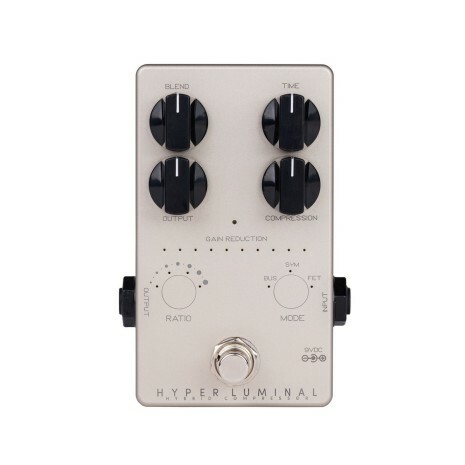 The Hyper Luminal Hybrid Compressor has a current draw of 250mA. Only use a regulated 9V DC adapter with a center-negative plug. Due to ecological reasons, it does not accept batteries. Unregulated power supplies and/or higher voltages may result in suboptimal noise performance and even damage your unit, voiding the warranty.